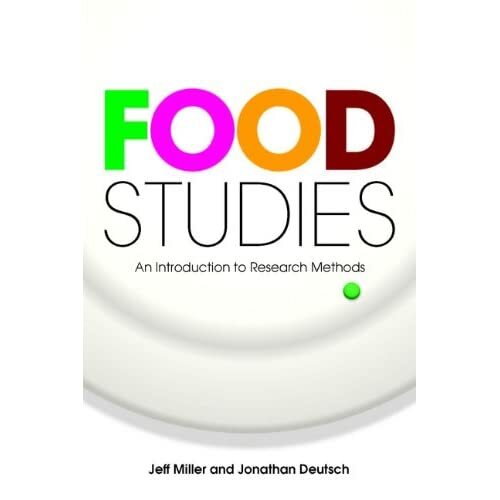 Since one of my primary interests is methodology for studying food in history, when I learned that Berg Publishers recently came out with Food Studies: An Introduction to Research Methods (2009), you can imagine how quickly I got my hands on a copy of this book written by Jeff Miller, a sociologist, and Jonathan Deutsch, an expert on hospitality management with an interest in nutrition. My hopes towered as high as a golden soufflé. But, to paraphrase what Forrest Gump said about a box of chocolate in the eponymous film, “You never know what you’re going to get.” And that adage holds true with books, too. In the case of Food Studies, I have to confess, what I found both heartened and disappointed me. To give it credit, Food Studies marks a milestone. It’s the first whole book to really address methodology vis-à-vis the study of food in academia apart from the laboratory or population-based nutritional surveys. Contrary to the publisher’s claim of aiming the book at students and independent scholars, the book should benefit anyone in or out of academia with an iota of interest in food and contemplating how humans feed themselves. The descriptions of the different approaches to research provide a good introduction and a refresher course in research methods regardless of the academic discipline and experience of the reader. Literature reviews, historical research, quantitative methods, observational methods, material objects in food studies, and technological tools — the authors cover all this in a relatively slim 218-page volume interspersed with interviews of scholars working in the field of food studies, like Ken Albala, Jeffrey Sobal, Carol Counihan, and Psyche Williams-Forson. I hate to say it, but the words “dry as dust” apply to this book. The flat, nay, academic, writing style in Food Studies invites ennui, not energy. Reading it calls up the experience of walking through four feet of snow without snowshoes. Hard, exhausting work, in other words. The authors, neither of whom are historians, devote only twelve pages of text to discussing methodology related to food in history. Following that is a thought-provoking eight-page interview with Ken Albala,** a well-respected historian whose expertise lies primarily in the Renaissance era. In that interview rests the kernel of what makes food history interesting and vital: Albala tells a story. He talks about a recipe, One Egg Made as Big as Twenty,*** and — by doing so — he does more to illustrate what well-done food history is about than anything else in Food Studies. But more than the lack of stories and illustrative case studies, the omission of certain references and the inclusion of others in the bibliography perplexed me. Some examples ought to suffice. But I reserve the coup de grace for the table of food studies research sources on page 69, where the authors list cookbooks as secondary sources. Under “Primary Sources,” Miller and Deutsch list “Original recipes.” That in itself is a contradiction, because how can we really know if the recipes are “original”? But the principal reason I disagree with them on this point is this: even if an author published a cookbook, and only five copies or even thousands exist, that cookbook records recipes peculiar to that author’s time period, social milieu, and aspirations. And maybe even that author’s kitchen. In many ways that cookbook reveals information every bit as useful as that from so-called “Original recipes” or even diaries or letters. Food Studies fails to completely plug the gaping hole of methodology for food scholars. It’s a beginning, but we still need more. The soufflé has, as it were, fallen. So it’s back to the kitchen, to finish the mixing and cooking and writing, so to speak. *The index is spotty and sparse, as well. And in the text itself, several glaring editorial errors stop the reader in his or her tracks: examples include “kids” instead of “kinds” on page 97 and “wailing” instead of “whaling” [in the sense of pounding] on page 98. Ken Albala is Professor of History at the University of the Pacific in Stockton, California, where he teaches courses on the Renaissance and Reformation, Food History and the History of Medicine. He is the author of 9 books on food history including Eating Right in the Renaissance (University of California Press, 2002), Food in Early Modern Europe (Greenwood Press, 2003), Cooking in Europe 1250-1650 (Greenwood Press, 2005), The Banquet: Dining in the Great Courts of Late Renaissance Europe (University of Illinois Press, 2007), Beans: A History (winner of the 2008 International Society of Culinary Professionals Jane Grigson Award and the Cordon D’Or award for Food History/Literature), Pancake (Reaktion Press, 2008), and the forthcoming World Cuisines written with the Culinary Institute of America (Wiley Publishers). To make an egg as big as twenty. ****Spencer, Maryellen. “Food in Seventeenth-Century Tidewater Virginia: A Method for Studying Historical Cuisines.” Ph.D. dissertation. Virginia Polytechnic and State University, 1982.